The company had been targeting April for the launch of its CST-100 Starliner spacecraft. 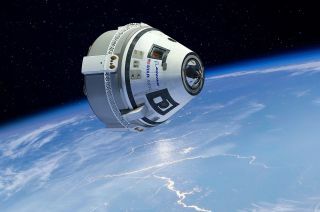 Artist's illustration of Boeing's CST-100 Starliner capsule in orbit. Crew Dragon already has one spaceflight under its belt: Earlier this month, the SpaceX capsule aced a six-day, uncrewed demonstration mission to the ISS known as Demo-1. SpaceX plans to conduct an in-flight test of Crew Dragon's emergency-escape system soon; if all goes well with that uncrewed launch, Crew Dragon could carry two NASA astronauts to the ISS on the Demo-2 demonstration flight as early as July. Contracted, operational missions carrying four astronauts will commence sometime after that. NASA signed the commercial-crew deals with Boeing and SpaceX to bring orbital human spaceflight back to U.S. soil. The nation has been without this capability since July 2011, when NASA retired its space shuttle fleet after 30 years of service. Ever since then, NASA has depended on Russian Soyuz rockets and spacecraft to ferry U.S. astronauts to and from the ISS. A seat aboard the three-person Soyuz spacecraft currently costs about $80 million.